February 23, 2017 | Sign up to receive The Teachers Edition. Giving back to the teacher who inspired him the most, Diners, Drive-Ins and Dives host Guy Fieri returned to greet his 8th grade teacher, Fran Fischer, who helped him" enter his pretzel pushcart in that year’s Humboldt County History Day." Read about why he remembers her and the incredible gift he gave her (Fecteau, People). Although this particular article is aimed at parents, it is written by a school counselor and is a helpful resource for teachers to read and to share with their parents. Developing strong and confident young ladies takes a well-rounded approach, and it helps when we all have the same information to rally around. Teachers spend a large amount of time with their students; we should make sure that we're doing our best to develop girls to be their best selves as adults (Fagell, Washington Post). A new pedagogy using games, group work and public speaking is helping students in Uganda break the cycle of poverty and youth unemployment. “Educate! is an experience-based education model where a mentor goes into a secondary school with 40 "scholars". The mentor spends time with the scholars, delivering sessions on entrepreneurship, leadership, critical thinking and problem solving ” (Bolton, Aljazeera). Those outside of the teaching profession may not understand why teachers are exhausted at the end of each day. Blogger and Michigan teacher, Paul Murphy, breaks down the scientific reasons why this is happening - decision fatigue and will power. Murphy explores why the fatigue exists, and plans to share some ways teachers can combat the exhaustion in a later post. In Littleton, Colo. district administrators decided to address the needs of one struggling elementary school by strategically deploying funds to hire teachers in creative ways. The new staff assist with English language learners, extra academic time, and support for students coping with issues outside the school building. 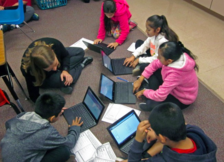 "You still have to have really high quality teachers who work really hard, but when you have the funding for those people, it is a dramatic difference,”says Lyn Bajaj, principal of Field Elementary (Brundin, Colorado Public Radio). Do Happier Teachers Lead to Better Student Outcomes? It's no surprise that teacher job satisfaction affects their performance, but a new study by Neena Banerjee of Valdosta State University and three professors from University of North Carolina-Charlotte confirms that students' reading scores are higher when they are taught by educators reporting high job satisfaction levels. However, being part of a professional learning community can mitigate the effects of job dissatisfaction (Will, Education Week). A school district known for its diversity aims to attain and sustain equity through blended learning approaches. 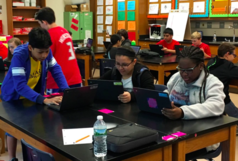 At Morris School District (N.J.), instructors and technology experts have found that balancing technology with face-to-face interaction can help struggling students excel. One strategy has been to provide all students with Chromebooks and in-home wifi, if they lack it. Fourth-grade teacher Teddie Salas says, “When students come to school, everyone is equal. Everyone has the same device, everyone has the same opportunity" (Curtis, EdSurge News). Sports, pep rallies, and school spirit can be a uniting factor for students of diverse backgrounds. 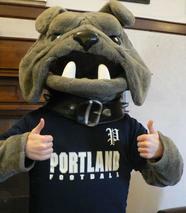 High school student, Kameron King, is the school's bulldog mascot and is also deaf. With the help of the cheerleaders and cheer coach, King is responsible for building enthusiasm at games and keeping support going for the team. King attends Portland Public Schools through a partnership with the Maine Educational Center for the Deaf and Hard of Hearing (Collins, The Forecaster). The Test Results. A new research report from the Center on Education Policy (CEP) District Leadership in the New Era of Assessment and a technical appendix are available on the CEP website. Many district leaders agree that new state common core assessments are better than previous tests, but others say it’s too soon to judge. The survey also reveals concerns about testing. Understanding the Great War • The latest education newsletter from the U.S. World War One Centennial Commission and the National World War I Museum and Memorial highlights the events and themes surrounding America's entry into World War I. This curated collection of lessons, primary source materials, and multimedia resources sets the stage for the actual 100 year anniversary of this historic event, coming up in April 2017. Read the newsletter. The Teachers Edition contains links to other websites and news articles. These links represent just a few examples of the numerous education reference materials currently available to teachers and the public. The opinions expressed in any articles or web pages do not necessarily reflect the positions or policies of the U.S. Department of Education. The inclusion of resources should not be construed or interpreted as an endorsement by the U.S. Department of Education of any private organization or business listed herein.